Blackadder’s comment was true. British losses in the Great War were almost unimaginable. On one day, July 1, 1916, during the Battle of the Somme, the British Army suffered 60,000 casualties. 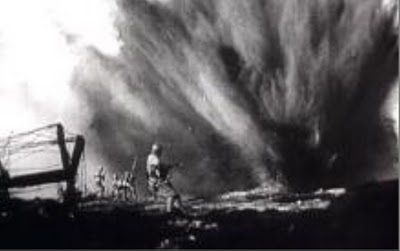 The reason that everyone always got slaughtered in the first ten seconds was related to the usual pattern of British attacks out of the trenches. British artillery would ineffectively pound a section of the German trenches that they intended to attack. About five minutes prior to the British troops, “going over the top”, the British artillery barrage would cease. The Germans would use the five-minute respite to emerge from their fortified trenches and set up their machine guns. Then they would wait for the inevitable British advance. And then they would slaughter the advancing British troops. Again. And again. And again. In an effort to reduce the slaughter, the Brits came up with the creeping artillery barrage. The purpose of the creeping artillery barrage was to deny the German troops the opportunity to set up their machine guns prior to the British troops arriving at the German trench line. A creeping artillery barrage began close to the British trenches and moved slowly forward, throwing up dirt clouds to obscure the British infantry who advanced close behind. The barrage would reach the German trench lines and force the Germans to seek cover while the attacking British infantry would be close enough to storm these lines (once the barrage had crept further forward) before the Germans could emerge from their trenches and set up their machine guns. As you might imagine, if the timing was off with a creeping artillery barrage it was not good for the advancing troops. There needed to be precise synchronization between the artillery gunners and the infantry advancing behind the barrage. Everyone involved needed a wristwatch. And they got them. The British War Department began issuing wristwatches to British troops by 1917 and by the end of the war, almost all enlisted men on both sides were wearing them. And they continued wearing them after the war. Wristwatches doomed pocket watches, the preferred men’s watch prior to the Great War. By 1930, the ratio of wrist to pocket watches was 50 to 1. I don’t wear watches much anymore, but I think I am going to buy a watch made by members of our extended American family pretty soon. I stumbled across a great blog all about watches, Worn and Wound, and read a post on a number of American watches I can choose from when I decide to buy a watch. Weiss Watches are made in Los Angeles. Cameron Weiss, owns Weiss Watch Company, and is a certified watch maker. 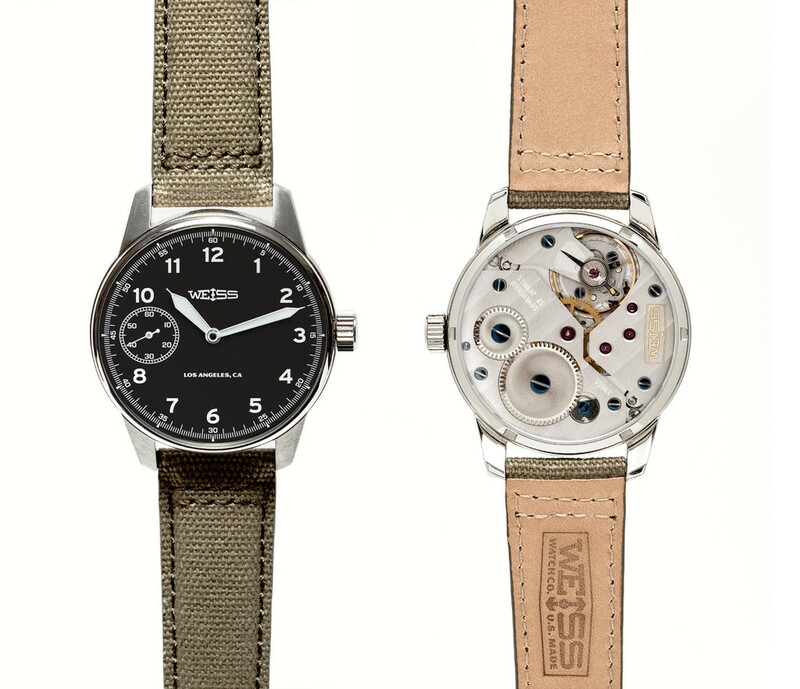 The movement, case and straps for Weiss watches are made by members of our extended American family. The Weiss Standard Issue Field Watch would not have been out-of-place during the Battle of the Somme or the Battle of the Marne. The Weiss Field Watch retails for $795. 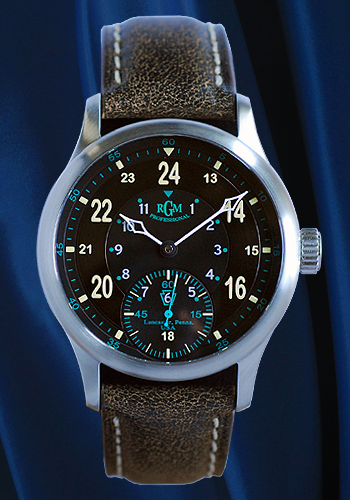 If my upcoming book, Simply American, Putting Our Extended American Family Back To Work sells well, I may have to buy myself an American made RGM watch. They are not cheap, but they are nice. 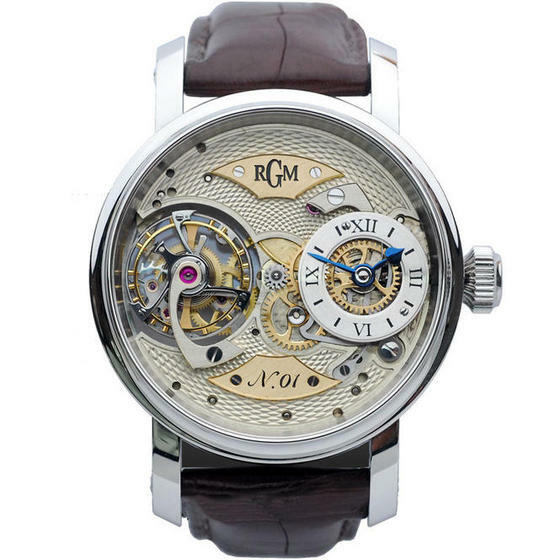 I might fancy picking up a RGM 801 if I want a service type watch. But if my book becomes a best seller and I appear on Jon Stewart and Colbert, I might have to spring for the RGM Pennsylvania Tourbillon, manufactured by members of our extended American family in Lancaster County. $95,000 in stainless steel, but pretty sweet you have to admit. Whatever American watch I buy, I know I will get a twofer. I will get a quality time piece if I ever have to participate in a creeping artillery barrage and I will be helping to create jobs for my American brothers and sisters who want to do an honest day of work. You can’t beat that. This entry was posted in american made, Made in America, made in usa and tagged American made products, Made in America, made in america products, made in america watches, Made in the US, Made in the USA, Made in the USA products, made in the usa watches, Made in USA products, Manufacturing, products made in the usa, RGM watches, watches made in the usa, weiss watches, worn and wound. Bookmark the permalink. Do your homework, who really came up with the creeping barrage? I don’t know Mud Gunner, who really came up with the creeping barrage?